grateful vintage, a photo by eatzycath on Flickr. When the cardmaking itch catches up, one can only scratch it.... and that's what I've been doing for the last week or so - and since my night classes haven't started yet, I might as well get in some private crafting time before things get busy again. 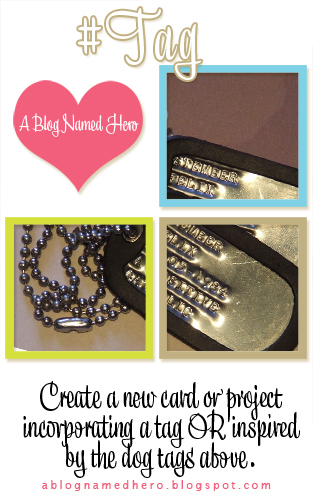 This card was made this afternoon for submission to A Blog Named Hero: Challenge #26 - objective: incorporate a tag into one's card or project OR be inspired by the dog tags included in the inspirational challenge graphic below.